Deity of Sri Vishnu carved in Athi (Fig) wood is very rare and is considered the most sacred. This form of rare deity is seen in Sri Varadaraja Swamy temple, Kanchipuram. The deity here is known by the name Sri Athi Varadhar and resides inside a holy tank inside the temple. Sri Athi Varadhar is brought out of the water once in forty eight years and poojas are performed to Him for forty eight days. Thus many of us could get a chance of having the dharshan of Sri Athi Varadhar only once in his lifetime. But there is another deity of Sri Vishnu in Athi wood in a place called Kozikuthi near Mayiladuthurai in Tamil Nadu. This temple, over 800 years old, is unique in that, it is the only one in the world where the presiding deity is 20 feet tall and it is carved out of single Athi (Fig) tree. 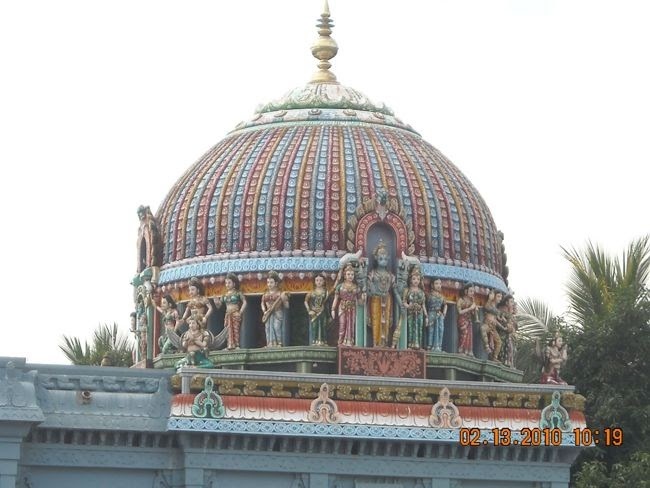 Mythology ordains that it was here that Sri Srinivasa Perumal (Vanamutti Perumal), who appears along with his consort, gave Vishwaroopa dharshan to Maharishi Pippalar. The massive idol is indeed awe-inspiring. This deity is known by the name Sri Srinivasa Perumal. In Tamil He is known as Sri Vanamutti Perumal. This presiding deity gives dharshan to the devotees all through the year. He is the only deity in the world who is carved out of a single Athi tree and is twenty feet tall. The Mythology of this deity, and how He got the name Sri Vanamutti Perumal and the place as Kozhikuthi is very interesting. Maharishi Sri Pippalar was suffering of a chronic skin disease. He prayed Lord Vishnu to get his disease cured. Lord appeared in front of Maharishi and told him that he had committed an offense of ‘hathi’ (doing to death) unknowingly. Therefore he had to take bath in the river Kaveri and pray to Lord Siva who will guide him. Accordingly the Maharishi took journey along the river Kaveri and took bath in the river and prayed to Lord Siva of the kshetra. When he was worshipping Lord Siva in a place called Moovalur, Lord Siva appeared in front of him and told to travel northward from this point. Lord Siva of Moovalur is known as Sri Margasahayeswarar since He shows the right path for his devotees. Maharishi then travelled northward. Maharishi Kappilar travelled for a while. He then took bath in the river Kaveri and prayed to Lord Vishnu for mercy. Lord Vishnu appeared in the fig tree and gave dharshan to Maharishi Kappilar, and the sin accured because of the murderous crime (hathi) he had committed unknowingly had been pardoned and he got rid of the skin problem. Since at his place one can get rid of the sin accrued of hathi, this kshetra came to be known as “Koti Hathi” and now the name is corrupted as “Kozhikuthi”. Since the Lord Vishnu had given darshan as a tall figure as if touching the sky to Sri Kappilar, the Lord is known as “Vanamutti Perumal” [one who is so tall that his head touches the sky]. The tank near the temple is known as Kappilar Thirtham. It is belived that by taking bath in this holy tank one can get rid of even ‘hathi’ sin. The garbhagraha vimanam is is the shape of an umbrella. There is no separate shrine for Sri Mahalakshmi, since she is seen residing in the right chest of the Lord. The Lord is hence known as Sri Srinivasan. Sri Booma Devi is seen close to the Lord in the Garbhagraham. Close to the Garbhagraham is Yoga Narasimhar, who is seen to be blessing Bhaktha Prahalada and is in the state of Yoga. Since the presiding deity is carved out of wood, there is no ‘abishekam’ for the main deity and the abishekam is performed for the uthsavamoorti of Lord Yoga Narasimhar. The Lord is made of single Athi (Fig) tree with four hands holding Sangu [counch], Chakram [disk], Gadhai [mace] and through His fourth He assures His devotees [abhaya]. Tulasi mala, Yagyoapaveetham and other Ornaments adores the Lord. The Lord’s lotus feet are even now rooted in the living tree. Since the Lord is carved out of fig tree the deity had been painted with colours obtained by natural leaves and herbs. There is a separate shrine for Lord Anjaneya [Hanuman] in the temple. The Lord is seen standing is a ‘ullasa bhava’ with His left leg slightly folded in a easy way and His right leg is seen secured to the ground. Thandai adorns the lotus feet of the Lord. Wearing a katcham, over which a uthriyam is tightly fastened over which there is a weast ornament. The two palms are held together in a ‘pranam’ posture. His adorns ‘kankanam’ in wrists, ‘keyuram’ in the upper arm, and bhujavalaya on shoulders. Lord is seen wearing ‘yagyopaveetham’ and His neck is adorned with five different types of mala. He is seen wearing ‘kundala’ in His ears which is crowned with ‘karna puspha’ and His kesa is neatly tied with a ornamental ‘kesa bandha’. Lords ‘pingaksha’ is bright large and glowing bestowing benovalance to the devotee. Moovalur is 3 km from Mayiladuthurai on the Kumbakonam road. Kozhikuthi is 3 km from Moovalur. Mini buses bound to Vaanathi Rajapuram from Mayiladuthurai pass through Kozhikuthi. From Mayavaram Bus Stand, drive on the Kumbakonam Highway. Take a right at Moovalur (3 kms from Railway station) and drive North 3 kms to reach Vanamutti. Alternately, from Mayavaram take the Poompuhar- Kallanai road (North of Railway station) to take a right at Chozhapettai to reach Vanamutti. 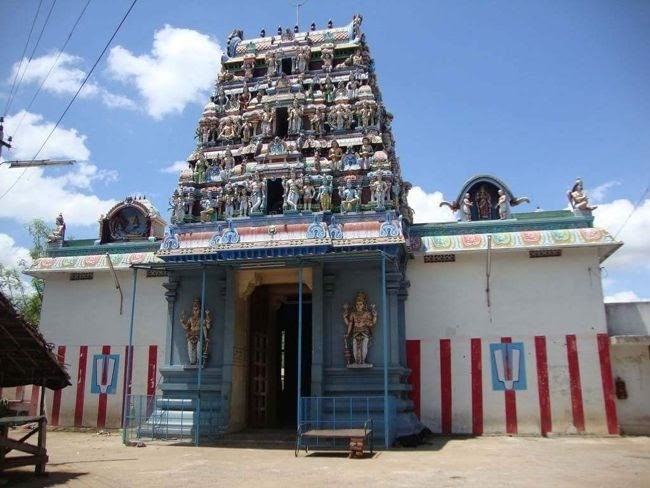 The Temple is located at about 6 kms North West of the Mayiladuthurai Railway Station. Nearest Airport is located at Trichy.